DefPro specializes in delivering quality refurbished cargo containers to all of Passaic. You won’t find plastic or wood units at DefPro, just all steel frames for maximum security. Customers at construction sites or retail space typically use these highly durable, watertight used shipping containers for storage in Passaic. Let us help you find your next container, pick up the phone or enter a few details in the form now. Start with what size you need (10, 20, 30 or 40ft. are standard unit sizes in Passaic) and condition of shipping container you'd like to buy, the zip code that you need the container delivered to, and when you want it delivered. You can get started by completing the quick online quote request form or giving us a call right now. We partner with regional intermodal shipping companies, portable storage container companies in Passaic and local storage depots and match your request to the best local suppliers. They will provide you with fast, hassle free price quotes on the shipping container that you've requested via e-mail or telephone, whichever you prefer. Once you compare the free quotes for prices on used shipping containers in Passaic from local suppliers you can select the best deal. Of course there's no obligation to buy anything and you can review the service contract before making a decision. Rates will vary based on how far you are from the Passaic container depot and how many units are currently available. Customers who use DefPro.com to compare quotes when buying a cargo container in Passaic save over 30% on average compared to customers who do not compare prices. Most customers in Passaic want a cheap shipping container to buy quickly for their immediate need. We advise to think long term, that you will live with this purchase for many years and it is also important to focus on quality and not just price. Our average Passaic container prices below reflect both ‘as is’ containers with visible dents and rust and virtually new one trip containers fresh off the boat. Dimensions: 40'L x 8'W x 8'H. These are the most common containers used in international shipping. Total capacity is 2,560 cubic ft. A one-trip 40' shipping container in Passaic costs from $4,000 to $5,000 and a WWT or CW costs from $3,300 to $4,200. Dimensions: 20'L x 8'W x 8'H. Commonly seen at construction sites across Passaic, these are a great way to conveniently store things on site. Total capacity is 1,280 cubic ft. A one-trip 20' shipping container in Passaic costs from $3,000 to $4,000 and a WWT or CW costs from $3,300 to $4,200. Dimensions: 10'L x 8'W x 8'H. The smallest container offered is a good option for on-site storage in areas where you don't have enough space to fit a larger container. Can conveniently fit in most backyards and has a total capacity of 640 cubic ft. A one-trip 10' shipping container in Passaic costs from $2,800 to $3,800 and a WWT or CW costs from $2,200 to $3,300. Dimensions: 20'L x 8'W x 8.5'H. With an added 6 inches in height, this container has a total capacity of 1,360 cubic ft. A one-trip 20' HC shipping container in Passaic costs from $3,200 to $4,200 and a WWT or CW costs from $2,800 to $3,600. Dimensions: 40'L x 8'W x 8.5'H. The largest container that you can usually find. Total capacity is 2,720 cubic ft. A one-trip 40' HC shipping container in Passaic from about $4,500 to $5,500 and a WWT or CW costs from $3,800 to $4,700. High Quality Containers - All sea containers are wind and water tight (WWT) and seals are checked before purchase. "New", one-trip shipping containers are also available and are typically in ‘like-new’ condition. Save Time - Quickly and easily compare prices from the best suppliers delivering to Passaic. Simply take a minute to complete our quote form, sit back and wait a few minutes and you'll be comparing quotes. Get the Lowest Prices in Passaic - Simply put, when you compare prices you will get lower cost shipping containers. We created DefPro Containers to make sure that customers always get the lowest price. The Best Selection of Sizes & Configurations - Do you want a 40' container with standard swinging doors on both ends, or a 20 ft container with roll-up doors on one side? DefPro.com makes it easy to get the exact container that you've been looking for with customizations including shelving, ramps, ventilation and lockable doors. When it comes to buying a shipping container in Passaic, we don't think you should compromise. Can I inspect the container before purchasing? In most cases you cannot inspect the container before you buy it, but you can often view pictures. When buying a used shipping container it's important to purchase from a reputable supplier, like one that you'll find with DefPro.com. If you find an ad online and a container is listed at a price that seems too good to be true, it probably is. Are all of the shipping containers that you sell in the same condition? No, we sell a variety of containers. In Passaic we can deliver new one-trip containers, wind and water tight containers (WWT), IICL5, cargo worthy containers (CW), iso certified containers (I.S.O. ), and as is. One trip containers often have minor scratches, but very few dents, and no rust. They are in the best condition and are also the most expensive. Cargo worthy containers are certified for shipping and are in very good condition but the paint won’t be perfect, usually far from it. WWT, or wind and water tight are the most common type of shipping container we sell, and they are also the most economical. How secure is storage with a shipping container? When all steel framing is coupled with advanced locking systems, portable storage containers in Passaic are extremely secure. Not only will your valuables be kept safe from pests, rodents and water damage, they'll be kept safe from robbers as well. 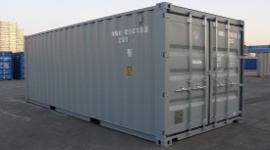 Simply put, your best option for outdoor storage in Passaic, conex containers are the best option. What are I.S.O. containers made of? Intermodal shipping containers are made of extremely strong and durable corrugated steel on the exterior. 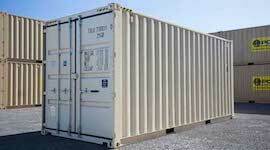 Steel conex containers in Passaic are built to withstand rough ocean conditions and harsh weather. The interior is typically completely empty, except for the wood flooring which is varnished with a protective coating to make sure that there are no bugs and pests. 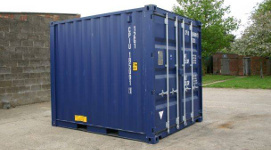 Can I buy a custom storage container in Passaic? Yes, you can purchase custom containers on DefPro.com! Some common customizations are advanced locking systems, ventilation systems, access ramps, additional doors, roll up doors, windows, racks and organization systems, custom paint and more. Do I need to do anything before my cargo container can be delivered? Passaic typically doesn’t require a permit to keep a container on your own property but it can be worth checking just in case. The main thing that you need to do is figure out where you will be keeping your unit. Keep in mind that you need a firm, flat surface (grass, dirt, asphalt), and that the delivery truck needs to be able to access the area. Make sure that there's room for the flat-bed delivery truck to drop the container off. Looking to buy a cargo container in another New Jersey city?